Over the last two weeks we have been on a journey of transforming our inner critic. We began by befriending our inner critic and then bringing awareness to our inner critic. If you have not done Yoga 276 or 277 then you need to go back and do those classes now as this series is cumulative and relies on the knowledge you gained in those two classes. 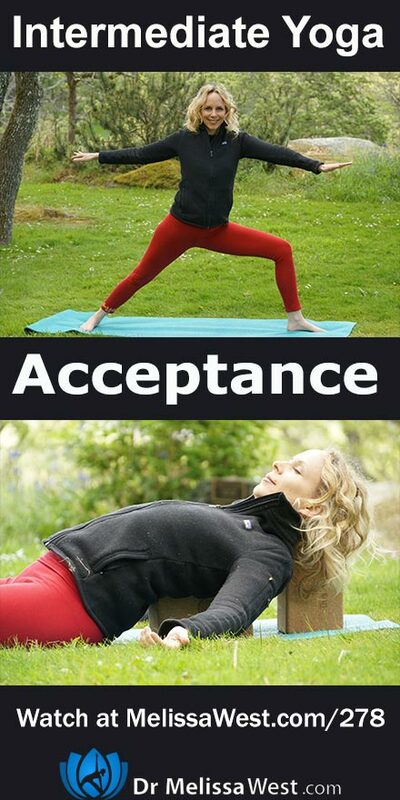 In today’s class we are going to learn what it means to bring acceptance to the role of our inner critic. 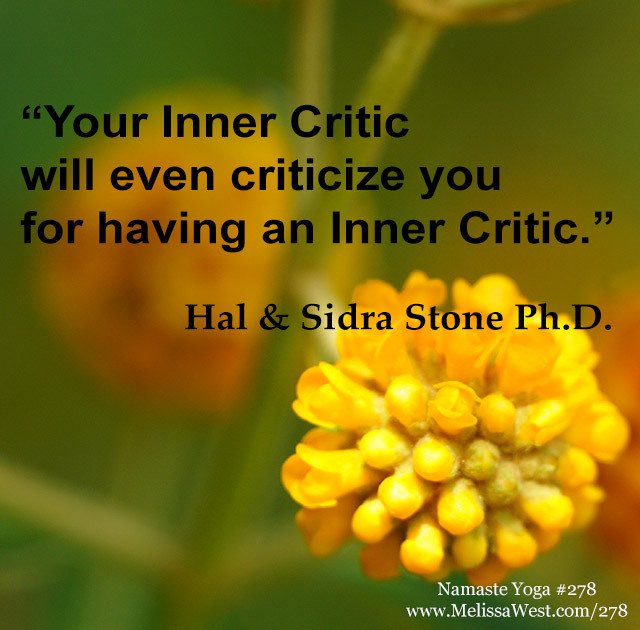 Remember that the role of our inner critic is to criticize. That is its sole jobs. 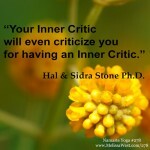 Hal and Sidra Stone in their book, Embracing Your Inner Critic: Turning Self-Criticism into a Creative Asset, use the example of Jane’s inner critic and it’s role in her personal and spiritual growth. Here are some of the things that Jane’s inner critic says to her about her spiritual life. Jane’s Rule Maker has made rules that Jane is supposed to live by. Jane is supposed to be loving at all times. Anger is bad. Anger at her children is terrible. Her marriage should be blissfully cordial and she should never have thoughts while she meditates. The more we try to be perfect, the more the pusher, perfectionist and rule maker will come in and show us all the ways we aren’t measuring up. When we try to be loving, our critic will show us how negative we are. When we try to clear our mind from thoughts from meditating all we will do is think. We can accept that our inner critic’s rules are impossible to live by. As Hal and Sidra Stone point out it is like telling somebody to go and stand in the corner and tell them not to think about an elephant. The harder you try, the harder it is to get the elephant out of your head. The same it is with standards of your inner critic. In fact, your inner critic is with you right now as you are taking this yoga class on accepting your inner critic and this series on transforming your inner critic. It is gathering the information and it will use it against you. It will probably criticize you for having an inner critic. Your rule maker will say you shouldn’t have an inner critic. Your perfectionist will say you should be doing this series perfectly and your pusher will say you should be doing this series right away and more of it. Today’s question to respond to in the comments is: Have you noticed your inner critic criticizing you for having a critic? We can give you even more value and support in your journey to transforming your inner critic on our membership site. Check that your name is showing up in our credits at the end. The 15 min TCM stomach yin yoga sequence from the morning series, take this class from the perspective of accepting what is offered to you through the day. It is a great class to observe how you accept or reject what is happening in your life. Let us support your yoga practice and help simplify your life. We know that you are overloaded and overwhelmed. We can take care of all the scheduling and planning of your yoga practices for the week so you don’t have to deal with time management. In our membership community, our weekly challenges help you to declutter and destress your life. Let us take one of the to-do items away from your to-do list. I know that it is taking up brain space and leading to anxiety and overwhelm. When you join our membership site you get your classes scheduled for you. You can relax knowing that it will be done for you each and every week.